Powers/Abilities: Sentry #372 was composed of alien materials which made it highly resistant to various forms of attacks like explosives, electricity, and other energy forms. It possessed superhuman strength (Class 50), and the ability to generate various forms of energy. It could shoot energy from the palm of the hands and from his visual receptors. From the visual receptors he could also emit rays which formed a cube of Colloidal Atoms. History: (Avengers West Coast#80 (fb) - BTS) - The Sentry #372 was one of the first Sentries produced by the Kree. 250 centuries ago Sentry #372 was transported to Earth, where it was placed in a hidden Outpost to protect the machineries and the items left there because they were declared outlawed. Among the items were the Psyche-Magnitron and the Nega-Bands. Sentry #372 was programmed to become active if someone entered in the lower chamber of the Outpost and no Kree Officer was present. (Captain Marvel I#17 (fb) - BTS) - The hidden Outpost became, in the following millennia, the Long-Lost Kree Outpost. (Avengers West Coast#80 (fb) - BTS) - In the Modern Era, several subjects entered the cave, and someone used the Psyche-Magnitron, but the Sentry never activated because the subject was (or was with) a Kree Officer, or because he remained in the upper level. (Avengers West Coast#80 (fb) - During the Kree-Shi'ar war, Rick Jones was kidnapped by the Shi'ar Imperial Guard and, hypnotized, drove the Guard to the Long-Lost Kree Outpost. Oracle, Tempest, Electron and Rick Jones entered the lower level to take a component of the Psyche-Magnitron to use it in the construction of the Nega-Bomb, but triggered the activation of Sentry #372. 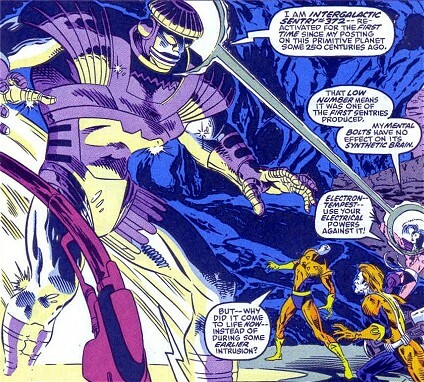 The Sentry started to destroy the intruders it recognized as Shi'ar, although they had changed their appearance during the last 25,000 years. Tempest and Electron's swift flight saved them from Sentry's palm-beams but they did no damage with their electric powers, as well as Oracle's mental bolts. The confusion caused by the arrival of Captain America, the Avengers West Coast and Warstar led the three Shi'ar thieves flee and forced the Avengers to confront the Sentry. Hawkeye's arrows and Spider-Woman's psi-webs were not effective on the Sentry, but Wanda's hex power helped Iron Man's repulsor blasts to find a weak spot in the chest of the robot. Felled by a trick, Sentry #372 used his eye-beams to destroy Spider-Woman's web and created a cube of Colloidal Atoms around Scarlet Witch and Hawkeye and was going to destroy them but it was hit by an energy blast by a Kree Cannon used by Iron Man and USAgent. Severely damaged, programmed to obliterate the Outpost if he could not defend it, Sentry #372 destroyed the cave and itself. (Avengers I#383) - Despite Sentry #372's effort, the Outpost wasn't obliterated. Arides succeeded in finding an Omni-Wave Projector. Comments: Created by Roy & Dann Thomas (writers), David Ross (pencils), Tim Dzon (inks). Rick Jones took the Nega-Bands from the Outpost but Sentry #372 didn't activate, so the Nega-Bands were placed to the upper level. Yon-Rogg and the Mandroid fought Mar-Vell near the Psyche-Magnitron, at the second level. Despite the presence of Carol Danvers, the Sentry did not activate because two Kree Officers were present. Maybe the Psyche-Magnitron stopped the Sentry? I don't think so. Maybe the Sentry didn't activate immediately but after some minutes, so Carol had the time to wear the costume, and when Sentry #372 was activating, its program checked again the identity of the subject and recognized a Kree in uniform? But what uniform? The Sentry had been programmed 25,000 years before the Supreme Intelligence gave to Captain Marvel his costume! And, thinking again, in 25,000 years the uniforms of the soldiers, of the Army, Space Navy, etc. should have changed a lot of times! Maybe the Sentry had a mind-scanning mechanism. It could check if the subject's mind had the patterns of a Kree Officer's way of thinking, and, in this case Carol's second personality matched the requirements. This could also explain the changes in the years of the Kree Officers' uniforms, but, how incredibly difficult would it be to program a robot to recognize if a person THINKS like a Kree Officer, and/or if he BELIEVES to be a Kree Officer! Maybe this second condition is more correct, because also the way to think like a Kree officer could've changed in 25,000 years. Also Kerwin Korman entered the cave, and also the Doomsday Man, but they obviously stayed at the upper level. This means that the Power Core of the Psyche-Magnitron found by Korman was a copy of the original, a spare or substitutive copy, stored above, and its radiations attracted Korman's sensors. But, he had declared he had searched all over the cave, when he first found the cave, and he was alone! This means he was not so good at finding treasures, and never went to the lower level. A very short time later, AIM scientists retrieved Korman fused with Doomsday Men from the Outpost and didn't trigger Sentry #372's defensive system, because they never reached the lower level. It would be rather strange, considering the variety of technological marvels they should have seen in those caves, but it is not, because a pick-up crew was probably sent by the Kennedy Space Centre to retrieve Doomsday Man. Probably the destruction after the explosion of the Magnitron Power Core had shattered in everything to pieces so the soldiers didn't lose time in examining the place further, nor did the AIM scientists before and/or later, or maybe they did it BTS and we still don't know what they had learned. Of course, when Minn-Erva and Att-Lass used the Magnitron, the Sentry continued to "sleep" because they were Kree officers. The geographical location of the Outpost is not so sure, because in Ms. Marvel I#4 and Avengers I#383 it was situated in Northern Florida, but in Avengers West Coast#80 the cave was somewhere in New Mexico! After Avengers West Coast#80 it was supposed to be destroyed but in Avengers I#383 the Outpost still existed, and above it there were buildings, even skyscrapers! Another question comes to my mind: Why did Mar-Vell know where the Outpost was and Yon-Rogg didn't? Was it a secret only told to some Kree Officers? It was considered Long-Lost, so nobody knew its exact location. Mar-Vell was entrapped in the Negative Zone but he knew that his condition had been caused in part or totally by the Negatron Sphere he was hit with shortly before. He knew that the particular kind of radiation that had entrapped and could have killed him had only one known antidote: the forbidden Nega-Bands. So he used this peculiar sense of the "Negative Radiations" as a radar or a sensor focused on the Nega-Bands and so was able to establish the exact location on the Nega-Bands and, of course, of the Long-Lost Kree Outpost. Sentry, Kree robot, used by Gnobians, @ Nick Fury: Agent of SHIELD III#5? or any other "Super" or "Sentry" character. The Long-Lost Kree Outpost was in a deep cave, situated in a desert area in the current northern Florida, USA (or in New Mexico). Its access was easy to spot and it was also shown on maps (Ms. Marvel I#4), but the lower levels were difficult to find. 25,000 years before the Modern Era, the Kree had decided to hide some of their most powerful and dangerous weapons. They choose the Earth and built the Outpost in a cave. Over the years the cave became the container of some legendary items and mechanisms, and its exact location was probably lost. There, were stored the forbidden Nega-Bands and the outlawed Psyche-Magnitron. Statues, devices, sources of lethal powers and a Sentry as guardian. Below the natural cave, there was the upper, first level, a vast chamber where the Statues and the Nega-Bands had been left. Under the first level, the second one, another chamber containing probably more lethal and powerful devices, such as the Psyche-Magnitron and an Energy Cannon capable to terminally damage a Kree Sentry with just one blast. A third, deeper level existed, where Sentry #372 had been placed at guard. (Captain Marvel I#17-18) - In the Modern Era, the Outpost was the battle field for the fight between the Mandroid and Captain Mar-Vell, and their battle damaged some machinery and also the Psyche-Magnitron. An explosion destroyed the upper level and probably the cave's entrance, too. (Ms.Marvel I#2-4) - Some time later, another battle took place there between Doomsday Man and Ms. Marvel and Destructor. The Destructor found a Power Source Unit of the Psyche-Magnitron, a Power Core, and opened it, releasing incredibly high radiations which caused an explosion. But, in this case, the Outpost levels involved in the deflagration was the upper level and the outside ground, but also the second level was damaged. (Avengers West Coast#80) - Another event which modified the structure of the Outpost was a very destructive one. 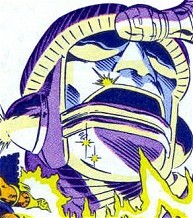 It happened during the Shi'ar/Kree War, when the Shi'ar Imperial Guard entered the lower level activating Sentry #372. The battle involved also the West Coast Avengers who managed to seriously damage the Sentry. Since Sentry #372 was programmed to destroy the Outpost if it could not defend it, the Sentry auto-destroyed itself and the Outpost. (Avengers I#383) - High buildings were built above the Outpost. 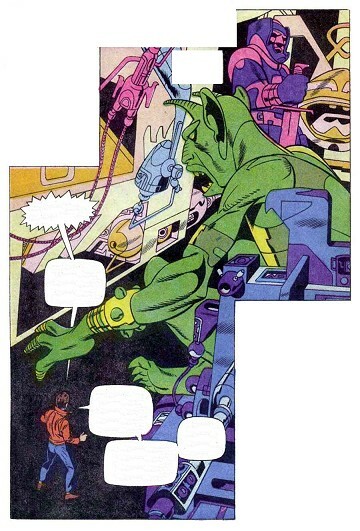 Arides, become a being of photo-mesonic energy, went to the Outpost near Cape Canaveral and found an Omni-Wave projector he used and tried to contact the Kree Empire. The Avengers tracked him down and a battle was fought in the building above the Outpost. Arides fled.